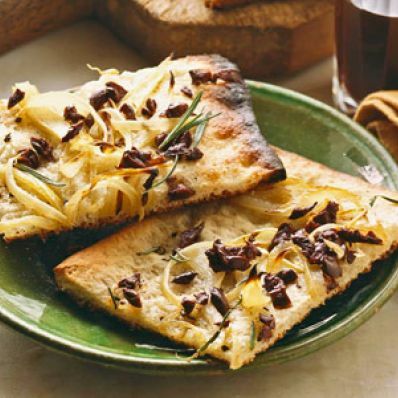 Top refrigerated pizza dough with sauteed onions, olives, and rosemary and it becomes a savory bread to serve with soup or salad. 1 of 1 Saute onions in vegetable oil in skillet until softened. Spread refrigerated pizza dough on greased baking sheet. Spread onions evenly over dough. Top onions with chipped, pitted Kalamata olives, dried rosemary, salt and pepper. Drizzle with olive oil. Bake in 450 degrees F oven for 18 minutes or until onions are lightly browned.